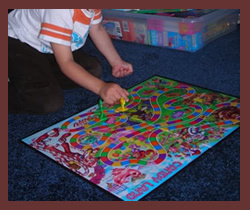 The Candy Land board game is such an old classic, but gets new fans each and every year. I'm not surprised! Are you? I can easily remember playing Candyland with my mom when I was a child. I think she used to do her best to let me win. :) That's kind of hard to do when playing the Candy Land game because it's such a game of chance. Nevertheless, I find myself doing the exact same thing, now that I'm "all grown up" and playing Candyland with the children in my life. If you happen to be one of those "deprived" people who have never had the chance to play the candy land game, let me give you a quick run down on how the game is played. As the name implies, the game board displays a colorful land full of the sweets your childhood imagination would really delight in. There are different versions of the game, as there have been updates, additions, and minor changes as the years have progressed. These days you can buy a Candy Land board game with various characters including Dora the Explorer and Winnie-the-pooh, if they happen to be favorites with your children. For me, I like to stick with the old traditional edition that focuses mainly on the candy! The game itself is easy to play, so even the youngest children can join in. Each person gets a colored game piece that they move around the board. The game comes with a pile of cards that are shuffled at the beginning and placed in a pile - face down. To take your turn, you simply draw a card and move your piece according to the color (or location) on your card. For example, if you pick up a card with two red squares on it, you move your piece to the second red block in front of you. The winner of the game is the person who gets to home or the castle first. Yes, the Candy Land board game is a simple game, especially when compared to all the modern digital and online games, but you may be surprised how much your kids will enjoy sitting down with you to play one of these old favorites. The time spent with you laughing and playing will create a wonderful memory that your kids will look back on with fondness, just as I do.